Kritharaki me Fakes (pronounced fakhés) is a pasta dish made with orzo and brown lentils. This is a different way of making the Cypriot dish called fakhés moudzentra, which is a staple lentil dish, cooked with brown lentils and rice and then caramelized onions, which are called “tiganissi”, are mixed in. The only spices used are salt and pepper, yet this very simple vegan dish is not only very healthy but also delicious. Rice or pasta is not the main ingredient but it is mainly used to absorb the fluids and thicken the dish to resemble like a risotto and not a soup. When my friend Natasha, of 5 Star Foodie announced her new 5 Star Makeover Event which is to make any kind of Pasta and incorporate different kinds of ingredients, I decided to make over this classic Cypriot dish and turn it into a pasta dish. In the classic Cypriot recipe no tomato is added. I added some tomato paste, although I regret I did not add some fresh tomatoes as well, mainly to give it more colour, and when the dish was cooked I mixed some of the flavourable “pasto” in it, which made this humble dish into a “gourmet” dish. You can still make this recipe vegan without the meat and it will still tastes great. However, if you do want some extra flavour and don’t have pasto, try substituting it with another smoked meat or still add your favourite sausage to it. Clean the lentils as sometimes some debris may be found in the package and then wash them. Put them in a saucepan with enough water to cover them boil for five minutes. Drain them and add fresh water and put to boil again. Meantime, in a frying pan heat the olive oil and sauté the onion until it caramelizes and starts to turn to brown. When lentils begin boiling again mix in the tomato paste, lower heat and cook for fifteen minutes. Then add the pasta and season with salt and pepper and mix in the caramelized onions, together with the oil and simmer for another 15 – 20 minutes, mixing every now and then, until the pasta is cooked.If needed add more water. Five minutes before they are cooked, cut the smoked ham in smaller pieces and mix in with the lentils and serve. Kritharaki me Fakes (pronounced fakhés) is a pasta dish made with orzo and brown lentils. This is a different way of making the Cypriot dish called fakhés moudzentra, which is a staple lentil dish, cooked with brown lentils and rice and then caramelized onions, which are called "tiganissi", are mixed in. Then add the pasta and season with salt and pepper and mix in the caramelized onions, together with the oil and simmer for another 15 – 20 minutes, mixing every now and then, until the pasta is cooked. If needed add more water. The recipe for the original Fakes Moutzentra is included in my cookbook Mint, Cinnamon & Blossom Water, Flavours of Cyprus, Kopiaste as well as in Volume 1 of my e-cookbook, sold on all Amazon stores. I love my orzo slightly tender…this is perfect for a COLD spring lunch! A great dish! I love orzo! Hi Demetra, Glad to see you here as well. About pasto, I always get it from Sparta but I am almost sure that you can get it in big supermarkets like Vassilopoulos. It is also known as syglino and next time I go to there I will let you know. What a great pasta dish! I still have to try Orzo… hopefully I will before I become 50 ;D. It's high time now I buy a package and try one of your recipes! I bet this would be great with some chorizo! I hva never cooked with orzo, this looks so so yumm. Oh Ivy! I am drooling…as a lover of lentils and orzo this is heaven. And I agree about the chorizo too! Once the weather cools down (still waiting!) this will be made in my kitchen! Thanks for the recipe. Pâtes et lentilles sont une première pour moi. Mmmm….. Ivy, I love orzo. I love making chicken noodle soup w/ orzo instead of egg noodles. I can pretty much be happy with orzo instead of traditional pasta any day of the week. This sounds incredible, Ivy! I would love to make this for my family – I know they would totally love this dish! Thank you so much for sending it in for the 5 Star makeover, an excellent entry! Just beautiful, Ivy. That plate pleads to be emptied. I love orzo and lentils! What a great combo…….interesting recipe,Ivy! This looks wonderful Ivy! I love orzo. Ivy, it is uncanny how closely Cypriot and Lebanese cuisine resemble each other; of course we don't use orzo just rice; looks mighty good! that's a delicious wholesome dish, Ivy! excellent recipe! Ivy I love this dish. I've only had orzo once in my life and I really liked it. I'm embarrased to say I've never cooked it myself, but I sure would love to make this recipe. 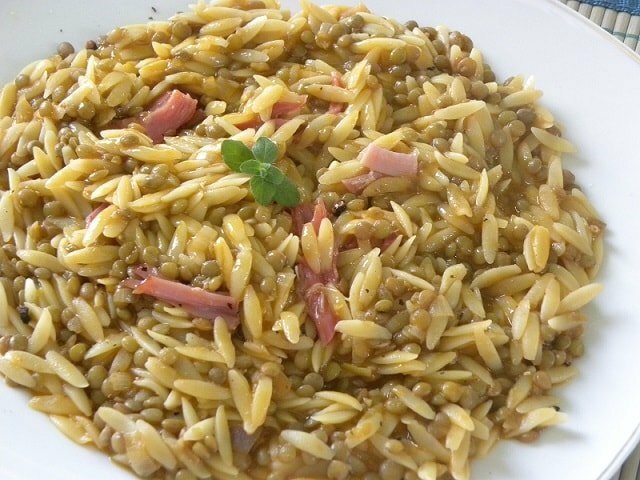 I love simple dishes with lentils, and this sounds great with the orzo and tomato paste! This is great comfort food! I love orzo pasta,almost looks like long grain rice. Thanks so much for alerting me .Hope the owner of the site responds to my request . thats fun, I posted a Kritharotto for the 5 star makeover event! I have not tried cooking with orzo before.